Featuring a terrace and a garage for 4 cars, the heated Apartamento Turistico La Casa del Gato apartment is located in the Navarran town of Azagra, a 10-minute drive from Calahora. The modern apartment is decorated simply and features parquet floors. It has a spacious lounge with a TV and a kitchenette equipped with an oven, microwave, dishwasher and washing machine. Breakfast is served in the neighbouring Hostal Vencia, and guests receive a special discount on other meals. Calahora offers a selection shops, restaurants and bars. Logroño is around 30 minutes’ drive away via the AP-68 Motorway. Pamplona can be reached in just under an hour. When would you like to stay at Apartamento Turístico La Casa del Gato ? Featuring a terrace and a garage for 4 cars, this heated apartment has a modern décor, a spacious lounge with a TV and a kitchenette equipped with an oven, microwave, dishwasher and washing machine. Please note that key collection takes place at Hostal Venecia, just 200 metres from the house, from 07:00 to 23:00. 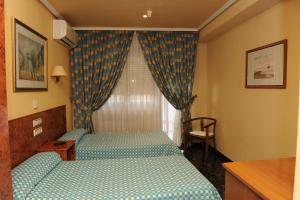 Each day we'll check prices and send you an email for your selected dates at Apartamento Turístico La Casa del Gato. If you don't have specific dates but would like to check prices for say next weekend or say next month we can check the price too. Click to write a review and share your experience of Apartamento Turístico La Casa del Gato with other travellers.